The price of canned coconut milk has doubled and tripled in the past couple of years, while the quality has changed and not for the better. Though prices have somewhat stabilized and may have even scaled back a little the last few months, it is unlikely that they will return to the same levels as before the spike – at least not in the short term. 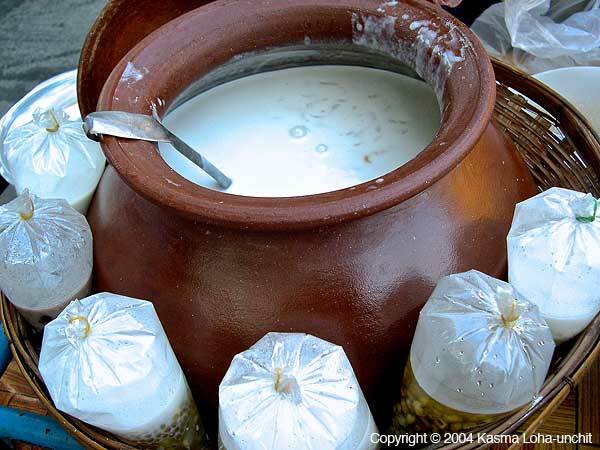 If you’ve noticed how your favorite brands of coconut milk, including the brands we recommend – particularly Chaokoh, seem to be different and not work as they used to in your Thai cooking, you’re right and it’s not your imagination. Many of our cooking students are concerned that they can no longer see coconut oil separating from the cream when they are heating it to make curries. And when making sauces and soups, they’ve noticed that the coconut milk unusually thickens rather than melting down to a smooth, lighter fluid. These things are happening because the large canned coconut milk producers have changed the way they make their products. The reason they had to do this is because of the acute coconut shortage – not from the skyrocketing production of canned and bottled young coconut beverages for the foreign market as some of our students have thought, nor from the devastating floods late last year, though this might have contributed to logistics costs. 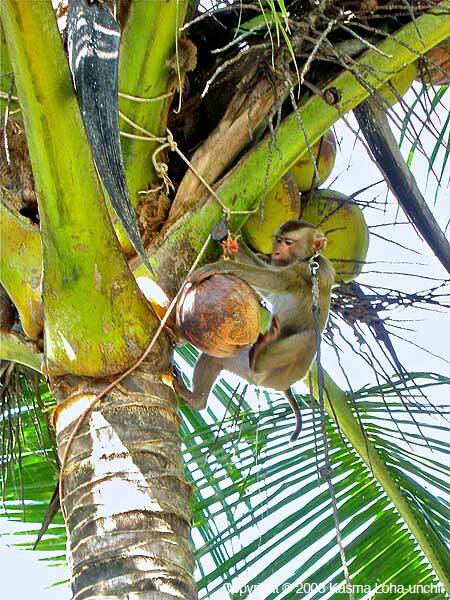 The culprit is a serous pest problem, aggravated by years of drought, that has destroyed hundreds of thousands of coconut palms in Thailand’s major coconut-growing provinces in the south. Notable are a number of non-native beetles, likely brought into the country with the ornamental plants imported from South Africa and Indonesia for the gardens of burgeoning tourist resorts. In Koh Samui where coconuts count as heavily in the island’s economy as tourism, the rhinoceros beetles, which are up to two centimeters long, and the even larger coconut leaf beetles lay their eggs in the unopened flowers of coconut palms and feed on the young leaves of the trees. Their voracious appetite kills the trees and the insects move on to their next victim. This severe infestation has destroyed over 125,000 trees on the island and cut annual yield by 20 percent in 2010 and 2011. 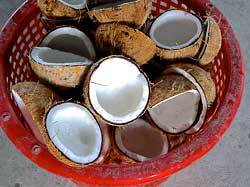 Of even greater concern is the tiny insect commonly known as the coconut hispine beetle (Brontispa longissima). Its minuscule size belies its ability in numbers to put the wheels of an entire industry to a screeching halt. Appearing in the midst of a two-year drought, this beetle has managed to decimate 35 percent of the coconut plantations in the southern peninsular province of Prachup Khiri Khan– by far the country’s largest coconut producer and famously known as the “coconut basket” of Thailand. This destructive pest is native to Indonesia and according to the United Nation’s Food and Agricultural Organization (the FAO), it has spread throughout the Southeast Asia-Pacific region through ornamental palm shipments. (One of my students heard that a similar beetle is starting to appear in coconut groves in the Caribbean and may become a cause of concern there in the near future.) 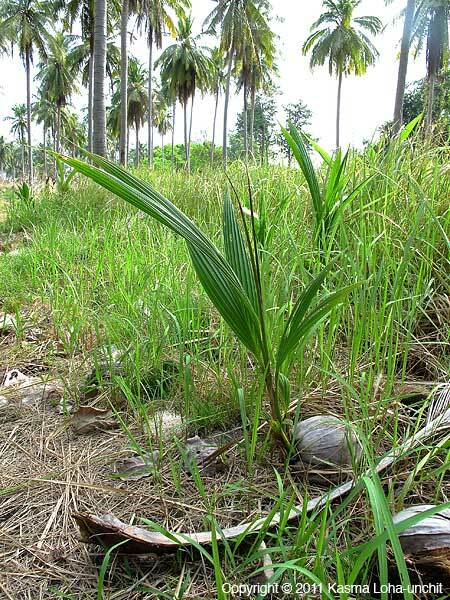 More than 20 species of palm are vulnerable to attacks by the hispine beetle with the coconut palm identified by the FAO as its “most favored host.” The insect feeds on seedlings and the young leaves of mature coconut trees and can quickly kill an adult tree in no time. 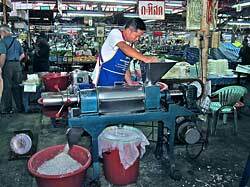 The grave beetle infestation shrunk supply and tripled the domestic price of coconut from the 6 to 7 baht each in mid -2010 to over 20 baht in late January 2011. 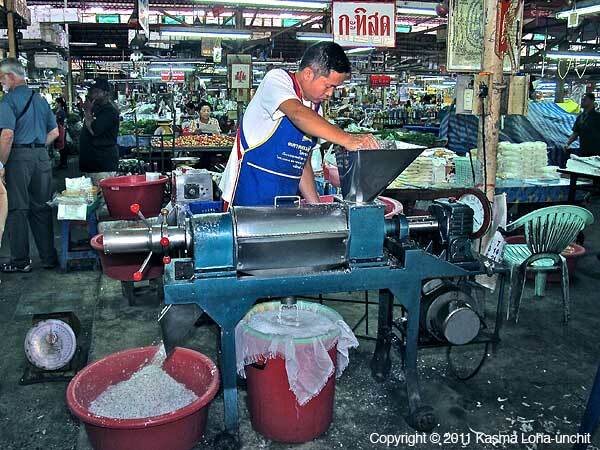 At the height of the disaster early last year, Thailand’s leading producer of coconut milk under the Chaokoh label was forced to import some 200,000 coconuts a day – ironically from Indonesia – but the volume the company was able to produce still fell far short of demand. 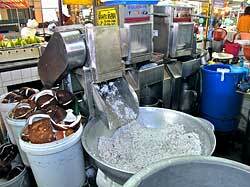 Over 500,000 coconuts are needed each day to produce Chaokoh coconut milk. A research team from Kasetsart University (Thailand’s premier agricultural university – much like UC Davis) is at the forefront in the fight against the much dreaded hispine beetle. Fortunately for those of us who prefer our coconut milk as natural as possible, the pests are being battled with biological means rather than toxic chemical insecticides. Three different biological agents have been tested and proven effective. One is a fungus whose spores germinate and grow inside the beetle, killing it within days. The fungus then emerges from the carcass and spreads to other hispine beetles. A second biological weapon is a predatory “stink” bug and the third is a parasitic insect that attacks the beetle at the larval stage. These natural tools are gradually eliminating the pest – good news for coconut growers. On Koh Samui, the Department of Agriculture is successfully using a parasitic insect to control the destructive beetles on the island. Local authorities are working hard to make the island a center of coconut production again. They have teamed up with tourism authorities to start a scheme whereby the 1.1 million annual visitors are asked to sponsor the planting of coconut seedlings: for 300 baht each their names will be put by the trees they sponsor. 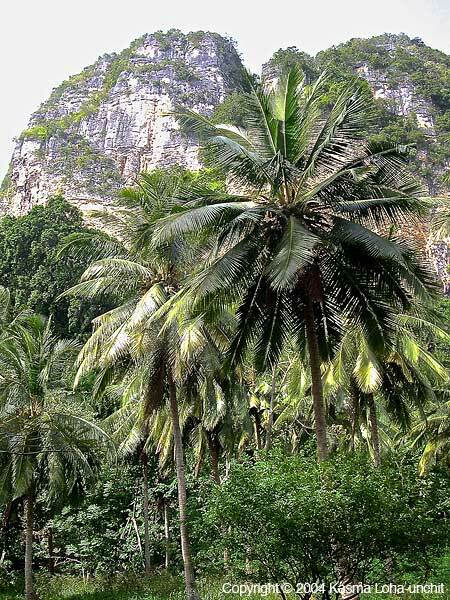 The goal is to plant a million new palms and as of June last year, a quarter of a million have been planted, Most have foreign names by their side as 85 percent of tourists to the island are from overseas. Coconut palms are recovering. Seriously injured and dead trees, plus old trees susceptible to diseases and pests, are being cleared from the plantations. Farmers are planting new drought- and pest-resistant hybrids to replace them. The catch is: it will take five to eight years for the new plants to mature and start bearing fruit. The coconut shortage will not be alleviated any time soon. The supply and demand situation means the price of canned coconut milk for those of us who cook Thai food in the Bay Area will likely remain high for several more years. 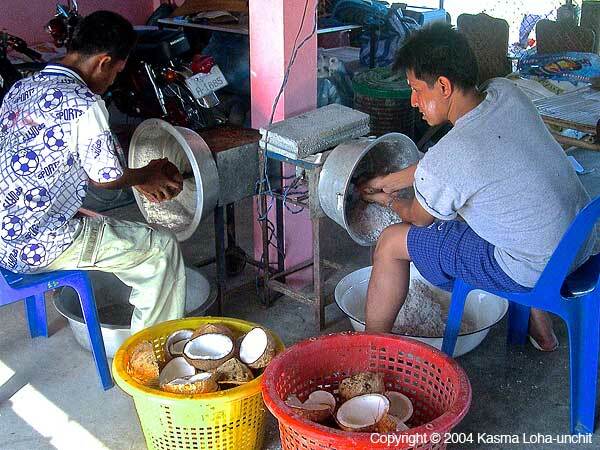 In an attempt to increase coconut milk production with limited supplies of coconuts, some companies, including the producer of Chaokoh coconut milk, have modified how they make coconut milk. The resulting products have noticeably changed and do not work quite the same way in American kitchens. We will cover how the products have changed and what brands we now recommend in Part 2 of our blog. 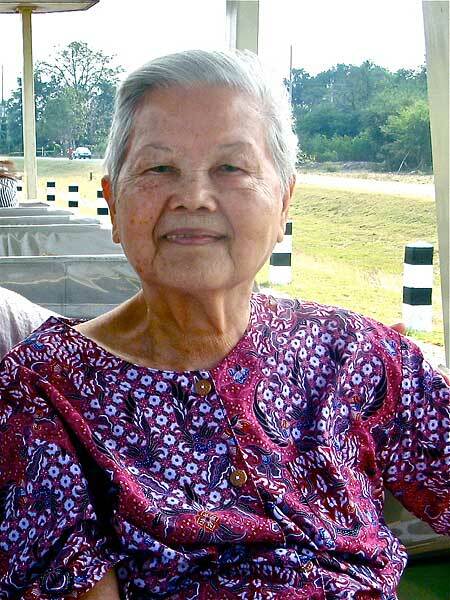 Recently Kasma’s mother, Somjai Loha-unchit, passed away. 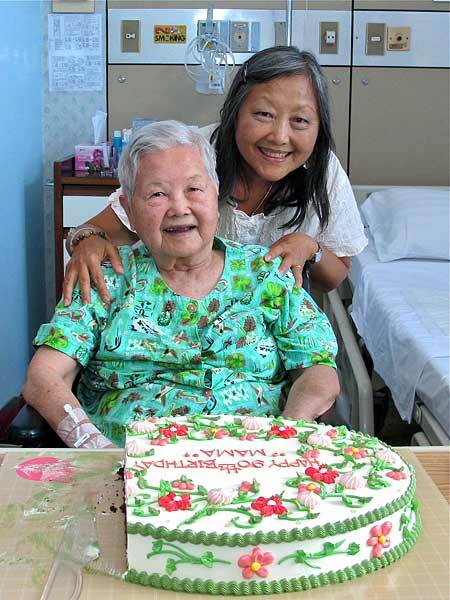 She had been quite ill for many years and living in a Thai hospital for the past two years or so. Her death, although long expected, still brings a wellspring of grief into our life. I especially wanted to acknowledge her passing on this blog because, in many ways, Kasma’s mother is the inspiration for everything that has appeared here. 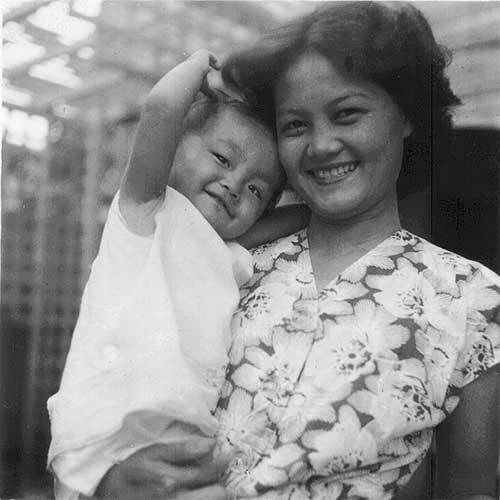 More importantly, she raised Kasma to strive to achieve what she wanted and not to settle for less. Largely because of her mother’s influence, Kasma left the corporate world (much to the dismay of her more conventional father) and ultimately ended up introducing Thai food and culture to thousands and thousands of people over the years. It really all began with her mother. Although her last years were difficult, Kasma would take her out on excursions whenever possible. Her mother had always loved the beach and this picture shows her playing in the sand on her last visit to the beach at Cha-am in 2010. And up until the end, mom did like her cake and ice cream. 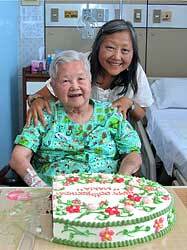 Here she was celebrating her 90th birthday in 2011. “Thank you so much for your email and your condolences. I really appreciate it. 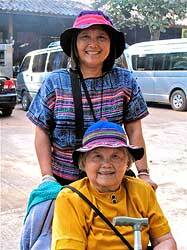 “A memorial gift isn’t necessary, but if you wish, I think you would honor my mother very much by making a donation to the Global Fund for Women. My mother fought to be recognized in an era and in a part of the world where women were oppressed and secondary to men. Raised in poverty without the resources to get an education beyond secondary school, she had the strength to lift us out of poverty by her frugalness, hard work and dedication to the family and was very vocal in making sure her daughters get an education equal to her sons. She was absolutely delighted when I honored her by giving up a prestigious job with a large American corporation to put the cooking and survival skills I learned from her to good use to create a life of my own. 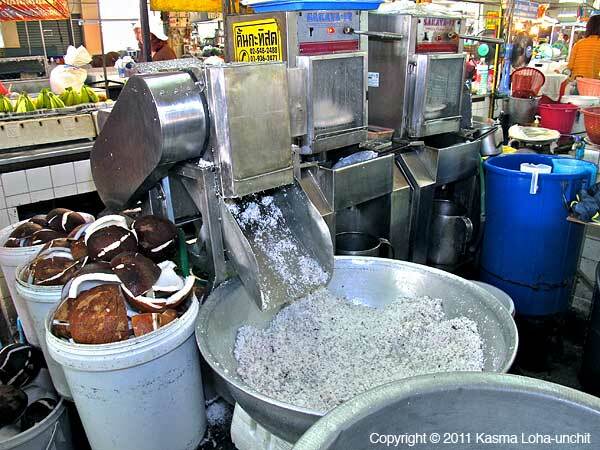 You are currently browsing the Thai Food and Travel Blog blog archives for November, 2012.